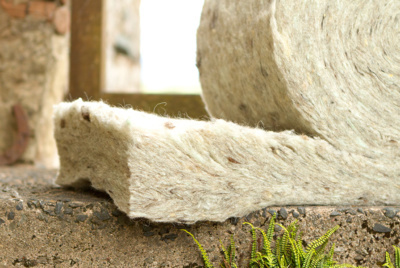 A great choice for insulating walls and roofs, CosyWool Slabs are manufactured from 75% British sheep wool combined with recycled polyester fibres. The slabs are flexible and slightly denser than rolls, designed to tightly friction fit in walls and roofs providing excellent thermal and acoustic performance. The wool rich blend ensures you get the full benefit of sheep’s wool with enhanced thermal and acoustic performance, durability and sustainability. The lofting agent maintains durability, fibre stability and structural integrity creating a long lasting insulation. CosyWool is odorless, soft, warm to the touch and easy to handle. You can install it yourself and it does not need to be replaced once in situ. Insulating with breathable natural fibres can contribute to more stable humidity and moisture levels within buildings, helping to improve the health of the building and the occupants. Thermafleece CosyWool Slab is safe to handle and can be recycled or safely disposed of at the end of its life.